Wood has been a mainstay in landscapes for years. It is often used to outline a border, to trim various types of beds that contain flowers or shrubs, in the construction of compost bins, and for raised beds for flower and vegetable gardens. Wood has a variety of functions in the landscape, raised beds for flowers and vegetables is just one option. What types of woods are more resistant to rot, decay, and insect damage? What types of wood treatments are safe when growing vegetables? Decay, caused by exposure to bacteria, fungi, and insects, becomes an important factor when boards and timbers are placed in contact with soil and moisture in the landscape. When considering wood materials for construction outdoors, it is common to think in terms of using the most decay resistant material with the longest life expectancy for the most reasonable cost. Natural woods that are slow to decay include redwood, cypress, cedar, and oak; however, these woods can be expensive. Premade raised beds may provide a more cost efficient option when considering untreated, naturally decay resistant woods. As an alternative, treated wood has become a widely used option in place of natural decay resistant woods. Treated wood is widely available and often the most economical. All wood begins to break down in the landscape over time, regardless whether treated or untreated. The purpose for treating wood with chemical preservatives is to make it more resistant to decay and effectively longer lasting when used for construction of various types. In the past, consumer wood products were dipped or pressure treated with inorganic (waterborne) preservatives, which include chromated copper arsenate (CCA), ammoniacal copper arsenate (ACA), and acid copper chromate (ACC). Copper (Cu) provided fungicidal activity, arsenic (As) provided insecticidal activity, and chromium (Cr) bound the preservatives to the wood’s structure. Potential leaching of these preservative components into soils has continually been a cause for concern. In 2002, the wood preserving industry made a voluntary decision to phase out use of arsenic and chromium containing preservatives in wood products for the general consumer’s use. Arsenic containing preservatives have continued to be used for treatment of industrial wood products. By 2004, the Environmental Protection Agency (EPA) moved for limited use of CCA (classifying CCA as a restricted-use pesticide for use by certified applicators) in products for residential use. These residential products commonly consist of landscape timbers, porch and patio decking, picnic tables, playground structures, fencing, and walkway materials purchased at local lumber outlets. Newer residential wood products are no longer treated with arsenic and chromium wood preservatives. Currently, wood purchased at lumber outlets for residential landscapes is treated with micronized copper azole (CA) or alkaline copper quaternary ammonium (ACQ). The appearance of copper azole treated lumber is similar to that of CCA treated wood, but has a green tint giving it the common name “green wood”. Treatment is done by dipping (cosmetic surface treatment) or by pressure (preservatives are distributed uniformly throughout the product). When dipped, treated wood is not usually recommended for contact with the ground. However, when fully pressure treated, boards and timbers may be tagged as standard for ground contact use. Cosmetically surface treated lumber is not standard for ground contact use. Lumber is labeled for ground contact use when wood preservative retention standards are met. Building supply stores may have Safety Data Sheets (SDS) available for treated wood by request. Concerns about the leaching of wood preserving materials into soils helped initiate the move from Cu, As, and Cr based preservatives to CA and ACQ for use in today’s residential landscape lumber. However, landscapes still have treated lumber from the days of copper, arsenic, and chromium use. Weathering is the potential cause for older landscape wood to release copper, arsenic, and chromium as well as current CA and ACQ components from newer lumber into soils. These leached materials have the potential to be taken up by garden plants roots and incorporated into edible food products. This process is termed “exposure pathway”. Copper, chromium, and arsenic naturally occur in plants, water, soil, and animals in low amounts. Plants and animals need low levels of copper and chromium metals for proper metabolic functions. While scientists generally agree that these elements can move from soil to the human body by way of edible plants, the process is highly dependent on soil type and degree of exposure. 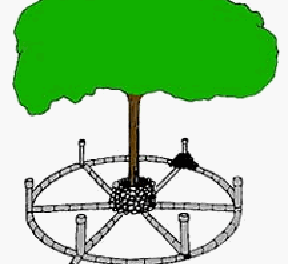 Degree of exposure is directly related to 1) the amount of treated wood in contact with the soil and 2) the amount of food potentially containing these metals consumed over time. As a safety precaution to the many variables influencing a particular site, it is advisable to avoid CCA treated lumber for landscape use. ACQ treated lumber is not expected to have adverse effects on the health of adults and children according to the published Human and Ecological Risk Assessment (2007). CA treated lumber is expected to have a similar toxicity risk to ACQ treated lumber. AWPA recommends use of UC4A or higher labeled treated lumber for horticultural uses. UC = Use Category; UC4 = Ground Contact; UC4A= Ground Contact, General Use; UC4B= Ground Contact, Heavy Duty; UC4C= Ground Contact, Extreme Duty. Treated lumber is commonplace in many raised beds used for vegetable gardening. Leaching of metals into soils with a near-neutral pH (pH 6-8) is less than in soils that are slightly acidic (pH 5-6) or highly acidic (pH 3-4). Once in the soil, Cu, As, and Cr have a tendency to bind tightly with clay and organic matter particles. In soils where clay and/or organic matter is high, these metals are more likely to stay in the soil. Additionally, plants vary in transport of these metals to above ground plant parts once sequestered by the roots. If concerned about using treated wood in a raised vegetable bed, regularly perform a heavy metal soil test in addition to a standard soil test. 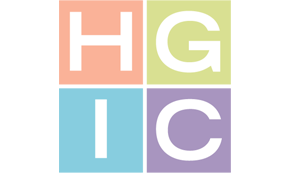 For more information on soil testing, see HGIC 1652, Soil Testing. Liming to a pH of 6.5 according to a soil test for home gardens will reduce some of the plant uptake of metals. If heavy metals are present, discontinue vegetable production in the bed, convert the site to a flowerbed, or replace the soil mix. Plastic liners can be easily fitted to the inside of a raised bed before adding soil contents. Further precautions can be taken if concerned about the safety of using treated wood in landscape features or gardens. Heavy-duty plastic sheeting can be placed as a liner to the inside surface of treated lumber structures for prevention of wood contact to plant roots by leached materials. If using this technique in a garden setting, be careful not to tear plastic lining during tilling or cultivation activities. If using treated wood for raised beds, plant vegetables 12 inches from the internal edge of the structure for added protection. Some commercially dyed wood mulches are made from recycled pallets and construction/destruction site wood debris. 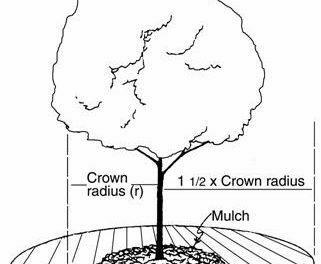 If heavy metals were used to treat these wood products prior to conversion to mulch, avoid using the mulch in a vegetable garden. The danger is not from the dyes used in the mulch, but rather from the potential leaching of heavy metals used in the original treatment. Treated lumber is prohibited for soil contact use in USDA Certified Organic crop production. Continued concern over the use of metallic wood preservatives has prompted the market to explore non-metallic wood preservative options for treated wood. Propiconazole-Tebuconazole-Imidicloprid (PTI) treated wood products are one of the newer options, though not readily available at most building supply stores. AWPA currently has standards for PTI treated lumber for above ground use, but has not set standards for PTI treated lumber for ground contact use. Even though heavy metals are not used in the newer wood treatments, fungicides and insecticides are likely used. These pesticides can leach into soils over time like with other wood treatment preservatives. Precautions similar to those taken with other treated wood should be taken with newer treated wood products when used in a vegetable garden structure. 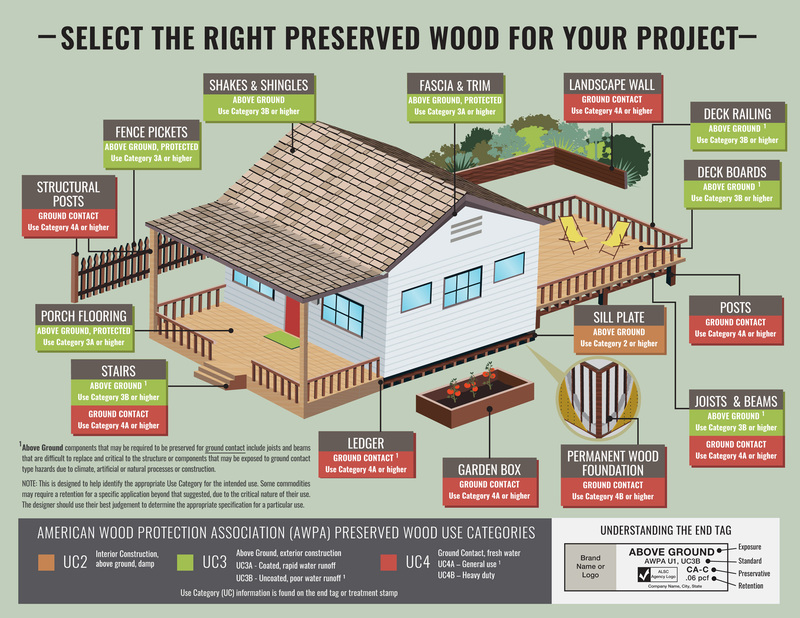 Alternatives to treated lumber for landscape use are also available. Commonly used materials include concrete blocks, brick, stones, wire mesh, plastic lumber, and wooden barrels. Natural or cast stone is an alternative to treated wood when landscaping a bed. Railroad ties can be purchased or reclaimed. What About Railroad Ties (Crossties)? Railroad ties are treated with a highly toxic organic (oil borne) preservative called creosote. It is advised to not use railroad ties that are oozing or smell of creosote in the landscape. Old discarded railroad ties should be used with caution. The inside surface of the railroad ties (internal to the bed) can be lined with plastic if used in a vegetable garden. Other organic preservatives of concern include pentachlorophenol and coal tars. No matter what type of lumber is used in the landscape, remain aware of potential safety hazards. Thoroughly wash harvested vegetables and peel root crops to reduce further health concerns.